Charges against a man accused of pointing a gun at an Orange March were withdrawn on Tuesday. During a mention that lasted seconds at Antrim Magistrates Court, a prosecuting lawyer said the PPS were withdrawing all charges against 34-year-old Christopher Donaldson. Donaldson, whose address has been made the subject of a reporting restriction, was not at court having been excused but he had faced five charges arising from an incident on July 8 last year. 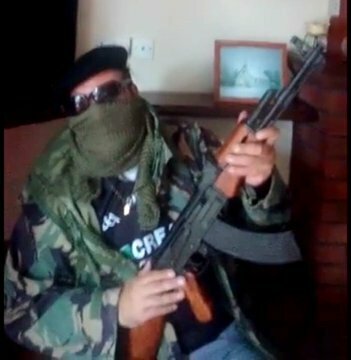 The 34-year-old was accused of having an imitation AK47 assault rifle with intent to cause fear of violence, doing a provocative act by “chanting sectarian slogans,” improper use of a communication network to send a message which he knew to be false, using threatening, abusive or insulting words or behaviour with intent to provoke a breach of the peace and possessing a single round of ammunition in suspicious circumstances. The charges arose after a video emerged of a man appearing to pretend to fire at an Orange parade in Randalstown. A second video uploaded to the same Facebook page showed a man positioning himself close to those on parade before making offensive remarks and chanting pro-IRA slogans. Previously the court heard that Donaldson accepted that it was him in the videos and further that he had been subjected to online threats against his safety. After the court hearing a PPS spokesperson told the News Letter: “The PPS received an investigation file from police relating to this matter on 28 November 2018. Following a careful review it was concluded that there was insufficient evidence to prove the criminal intent required to prosecute any potential charge.